If one is patient, watchful and knows where to go, bobcats and mountain lions can be seen on Mount Laguna. For most of my life, the only cat that I ever saw was the stuffed mountain lion behind the counter at the local store. He (or she) has remained on the wall more than 50 years. The taxidermist cut him in two and he was mounted front half and rear near the counter. Each time I go to the store I view him and consider how worn down he has become over the years and I wish he could groom himself like my cats do. Back when I was very young I was told that it was the last mountain lion in the Laguna Mountains. This was a disappointment to me to think that I was not going to see a mountain lion in the wild in my beloved mountains. I later learned that this was not true. The cats on the mountains are shy and elusive. What I like about them is that they behave so similar to our own house cats. They are sometimes playful and curious and love a good hunt. Their colors are beautiful and their motions are graceful. They seem to allow themselves to be seen only on their own terms. 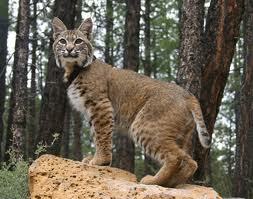 I saw my first bobcats in the spring of 2007. This is unusual as I hadn’t seen a bobcat in 50 years. Strangely, within a two week period, I saw three. Two were crossing the road at night and another was just hanging out along the roadside. He was apparently interested in watching cars drive by. As I drove by, he watched me and I watched him. He was crouching down at the side of the road apparently in a playful mood. I remember how the distinct dark stripes on the side of his face that merged at the corner of his eye made him look like a tabby cat. What a beautiful creature. I have not yet experienced my boyhood ambition of seeing a mountain lion. Though I have not seen one, I strongly suspect that they have been watching me. They are definitely on the mountain and they are doing well feasting on deer. I remember the story told by one of the past cabin owners about the time a mountain lion came to visit. The cabin owner arose very early one winter morning and sat in a chair adjacent to a porch window. Through the window he saw a dark figure come up the stairs and onto the porch. It came directly in front of him, sat down and stared in his direction. He was not sure if the cat was watching him or the blinking light in the clock next to him. The big cat sat and watched for about five minutes and then left in the same direction that he came. Mountain lions are potentially dangerous. I have not heard on any incidents at Mount Laguna. I encourage you to do as I do. Walk don’t run through the woods. Always stand upright and, when with others, remain in a group. It doesn’t hurt to bring along the family dog (I hear mountain lions don’t like dogs). When following this advice, you may not have any more luck that I have in seeing a mountain lion.